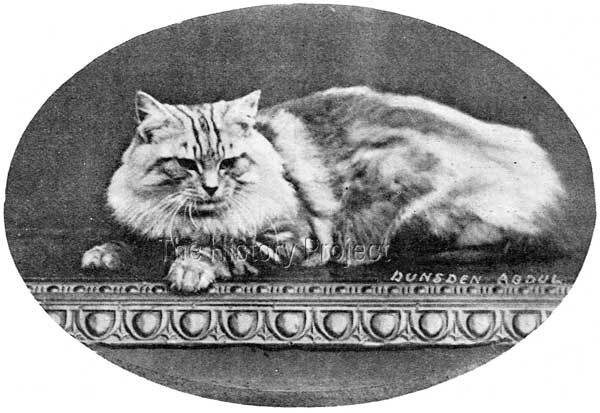 In the Silver Tabby colour variety, during this era which bordered the dying years of the 19th century and the first few years of the new 20th century, the leading stud male was unquestioningly Miss Anderson Leake's 'Abdul Hamet of Dingley'. He was, himself, a son of 'Abdul Zaphir of Dingley' who, in turn, was a grandson of Miss Leake's world-renown foundation Silver Tabby male, 'Ch. Topso of Dingley'. The two most influential sons of 'Abdul Hamet' were Miss Leake's own 'The Marquis of Dingley' (born in March 1901) and his sire-sibling bred by Miss Cope, namely 'Don Pedro of Thorpe' (born in April 1901) owned by Mrs. H. Slingsby. Along with their sire, 'Abdul', these three males formed a veritable triumvirate that dominated the show classes for this colour variety, either themselves or with their progeny. Any breeder wishing to break into the silver tabby conclave would ideally seek to purchase, or use at stud, any one of these three magnificent males. But all were descended from the common ancestry of 'Ch. Topso of Dingley' and through 'Abdul Hamet'. These successes were not limited to just the males from the line. Miss Cope, who began with a female named 'Silver Tangle'(Roiall Silver Tangle) bred by Mrs White Atkins, developed her own strain based almost entirely upon Miss Leake's foundation, producing in turn, 'Roiall Dewdrop', from 'Silver Tangle' and 'Thames Valley Silver King', (Dewdrop later being the dam of 'Don Pedro'), and then from 'Silver Tangle' to 'Abdul Hamet', the stunning 'Roiall Fluffball', described by Mr. C.W. Witt as "the best silver tabby living!"4. Another female from this breeding 'Roiall Silver Butterfly' was sold to Mrs. H. Slingsby, from where she took the name 'Silver Butterfly of Thorpe'. 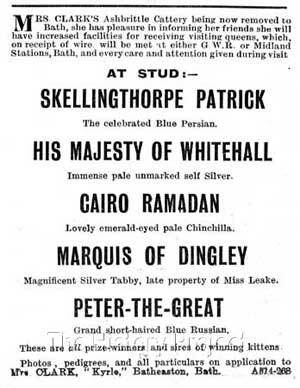 Along with their sire, 'Abdul', these three males formed a veritable triumvirate that dominated the show classes. So in context at least, 'The Marquis of Dingley' originally stood centre stage, alongside his famous sire 'Abdul Hamet of Dingley' and his ever popular younger half-brother, 'Ch. Don Pedro of Thorpe'. 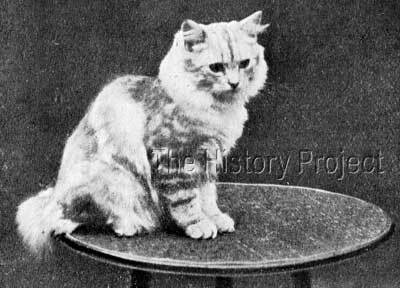 'The Marquis' was born on 24th March, 1901, bred by Miss Leake, out of her oldest Silver Tabby female, 'Miss Fluffie of Dingley'. The contribution of 'Miss Fluffie' to this combination should not, therefore, be overlooked as she brought into the equation two significant factors. Born in April 1894, she was a very senior female, being nearly seven years old when she produced 'The Marquis' and later, when nearly nine years old, both 'The Dingley Owlet' and 'Dingley Fashion'! 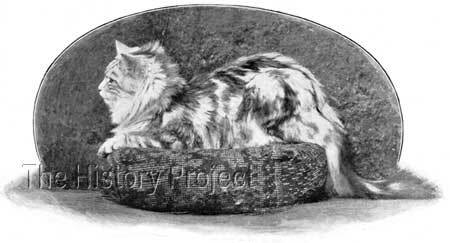 She was an able and reliable brood queen, and one of the very few surviving grand-daughters of Miss Leake's foundation Silver Tabby male, 'Ch. Topso of Dingley'. Therefore, through her sire, 'Ch. Felix', she brought to this combination a line-breeding on 'Topso', who was three generations back on the pedigree of 'Abdul Hamet'. She was therefore likely to have augmented and strengthened the polygenes for tabby markings in this combination. But what is lesser known is that her own dam was 'Brookville Fluffie', sired by none other than the world renown, 'Ch. Silver Lambkin'. What an amazing pedigree! Certainly at the early stage of his adult career, Miss Leake retained 'The Marquis' and proudly advertised him, extolling his successes on both the show bench and as a silver tabby stud cat. She also reminded everyone of the summary achievements of his sire, 'Abdul Hamet' as the sire and grandsire of practically every successful silver tabby on the show bench. Anyone reading these statements would be forgiven for thinking that 'The Marquis' was indeed a worthy successor to his sire. But for whatever her reason, she then advertised him 'For Sale', the first advertisement appearing in the 21st May, 1904 issue of 'Our Cats'; and subsequently followed by a second advertisement that appeared a week later, on 28th May, 1904. 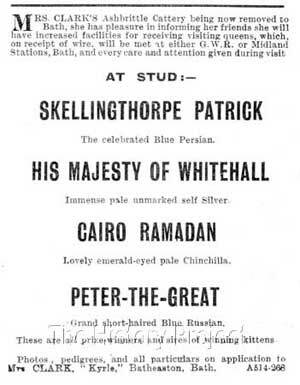 He was duly purchased by Mrs. Clark, of 'Ashbrittle' cattery fame, who counted among her famous stud cats the blue Persian, 'Skellingthorpe Patrick', the Chinchilla's 'His Majesty of Whitehall' and 'Cairo Ramadan', and the celebrated Russian Blue, 'Peter The Great'. Sadly, the joy of a new home, and a new and valuable stud cat, was to be short-lived, with the sudden and tragic loss of 'The Marquis' in less than three months. The report then goes on to give an account of the loss of the well-known Chinchilla male, 'Kuhe of Ranelagh', owned by Mrs. V. Roberts, as the result of a fight with another stud cat. There can be little doubt that the loss of 'The Marquis' would have been heartfelt for both Mrs. Clark, who had an excellent reputation for maintaining a collection of the highest quality stud males representative of their breed and colour, and for Miss Leake, who had clearly taken the very difficult decision to let him go so that he could contribute to the furtherance of the colour variety in another noted cattery. Sustaining the loss of such a valuable and successful son of 'Abdul Hamet' would have been keenly felt by all who followed and supported the progression of this strain of Silver Tabbies, duly descended from Miss Leake's memorable early male, Ch. Topso of Dingley. It would also have been a timely reminder that with any type of lifestock, circumstances can and often do change rapidly and unexpectedly. One litter sibling and two full younger siblings from a repeat breeding are recorded. The latter siblings were 'The Dingley Owlet', a Shaded Silver female subsequently exported to the United States, and 'Dingley Fashion', a Silver Tabby male who appears to have been shown successfully, jointly owned and later retained as a replacement for 'The Marquis', when he was eventually sold to Mrs. Clarke and later died under tragic circumstances. Although this appears to be the only litter sibling of record, subsequently sold for breeding to Mrs Paisley, another unrecorded sibling has since been traced in the form of the silver tabby female 'Dingley Koko'. DINGLEY KOKO, Silver Tabby female, no confirmed date of birth. Bred by Miss LEake. Owned by Mrs. Porter. This female is referred to in a letter to the Editor of Our Cats, published in September, 1904. The letter is written by her owner, Mrs Porter, who writes: "My other pets consist of a beautiful, graceful silver tabby queen, 'Dingley Koko', bred by Miss Leake, own sister to the late 'Marquis of Dingley'...."
Two factors muddy the waters of the siblings, 'Dingley Owlet' and her litter brother 'Dingley Fashion'. Both are sired by 'Abdul Hamet'' and out of 'Miss Fluffie of Dingley'. The first is in regard to their respective dates of birth. While 'The Dingley Owlet' is recorded as born 25th February, 1903, 'Dingley Fashion' has for his birth-date, 5th March, 1903. 'Miss Fluffie' was already approaching 9 years of age at the time of their birth and of course it was not possible for 'Miss Fluffie' to give birth 8 days apart, so one of the dates is in error. In this instance, we have decided to accept the earlier date as the correct one. The second point is that in the ACA Register, Volume One, 'The Dingley Owlet' is registered as a Shaded Silver, while in most data-bases, she is listed as a Silver Tabby. 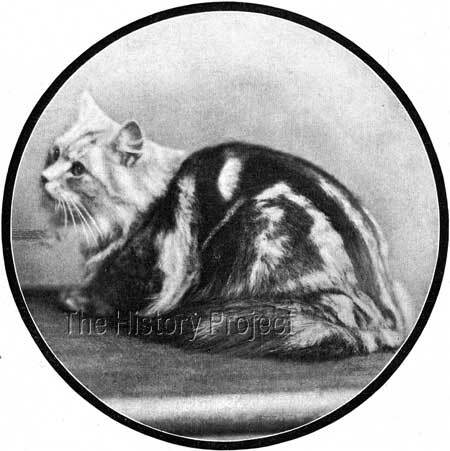 Both parents are registered as Silver Tabbies, but 'Miss Fluffie' had on previous occasions, produced Silvers (Chinchilla's and Shaded Silvers) when outcrossed to predominantly unmarked silver Lines. Both parents contained marked and unmarked silver heritage. Given that both her photos show a much lighter cat, with a general absence of bars except on the forelegs, we have erred on the side of Shaded Silver. There is no evidence of any progeny being recorded from 'The Dingley Owlet'. A litter brother to 'The Dingley Owlet' and, on paper, a full younger brother to 'The Marquis of Dingley', who had subsequently been sold. Maintained at stud, his services were duly advertised in a number of 1904 editions of Our Cats, along with the NCC registrations of subsequent progeny. By the time this image was published, he had attended only his first two shows, gaining two first prizes at the Crystal Palace, and a second at Birmingham. This image by J. Russell was likely taken at the Crystal Palace Show in late 1903. 'Ch. Don Pedro of Thorpe', a sire sibling of 'The Marquis of Dingley'. Between them these two stunning sons of 'Abdul Hamet of Dingley' dominated the Show bench for this colour variety, adding to the already considerable fame enjoyed by Miss Leake's strain for producing quality, well marked Silver Tabbies. Born as 'Roiall Don Pedro', this handsome male was originally registered with 'The Cat Club' as 'Edgbaston Don Pedro' which suggests he was intended to go to a Mrs. McMichael, a breeder resident in nearby Edgbaston, Birmingham. For whatever reason, this sale appears to have fallen through and he was eventually taken up by Mrs. Slingsly of Thorpe Hall, hence his final appellation. 'Don Pedro' was a strikingly marked robust male, who was a successful show kitten and an excellent stud cat. 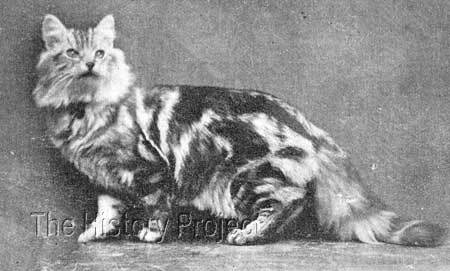 Along with his half-brother 'The Marquis of Dingley' and their common sire 'Abdul Hamet', he helped to dominate the Silver Tabby classes with cats from the 'Dingley' strain. With the sad loss of 'The Marquis' reported in September, 1904, the 'Don' became the young and pre-eminent successor in the male line, his main competition coming from a younger full brother to 'The Marquis' in the form of 'Dingley Fashion'. But it is mostly to the progeny of 'Don Pedro' that we find the continuation of the Dingley lines in the United Kingdom, initially through his sons, 'Don Roderick of Thorpe' (1902), 'Don Pasquale of Thorpe'(1906) and 'Monarch of the North' (1909). As far as can be ascertained, there are no other recorded offspring from this breeding, nor any subsequent offspring from 'Starlet'. Described by Mr. C.W. 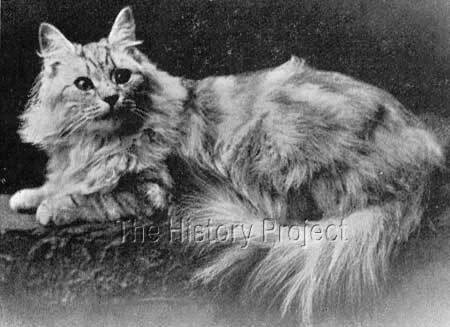 Witt in June 1903 as 'absolutely the best silver tabby queen living', 'Fluffball' was in fact a three-fourths sister to Don Pedro, being from the same sire and her dam being his grand-dam. In this combination, which was another line-bred, there was no outcross to 'Thames Valley Silver King'. 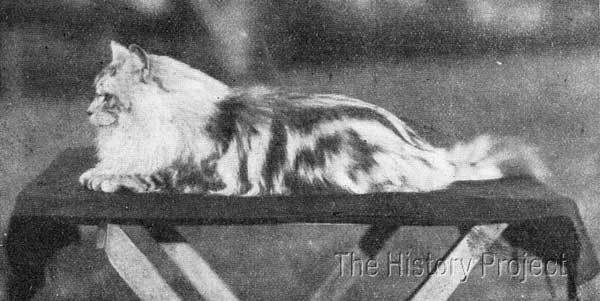 Like 'Don Pedro', 'Fluffball' was shown for spectacular wins as a kitten, taking first at Westminster in 1902, then in 1903, taking first at both Westminster and Bath. As a litter sister to Roiall Fluffball, 'Silver Butterfly' was a wise investment by Mrs Slingsby, as a future mate for 'Don Pedro". Upon this purchase, she became 'Silver Butterfly of Thorpe', was bred to 'Don Pedro' and produced the silver tabby male, 'Don Roderick of Thorpe'. Bred by Miss Anderson Leake. Owned by Mrs Dwight Cutler, of Woodward Avenue, Detroit, Michigan, imported directly from Miss Anderson Leake. Won a Third at Westminster in 1902, before export, and a Second at Clevedon, in the United States in December of the same year. ? Bred by Miss Anderson Leake. Owned by Mrs. F.J. Sarmiento, of Arlington Place, Detroit, Michigan, imported directly from Miss Anderson Leake. Litter sister to 'Dingley Bar Abdul'. Shown at Detroit winning First and Specials in 1901. This handsome male gained two seconds at the Sandy Show of 1904, and three seconds at the Crystal Palace, 1904. His seconds at Sandy were gained directly behind 'Don Pedro of Thorpe', who was Best of Variety and ultimately Best Long-hair Cat in Show, opposite Mrs. Collingwood's 'Miss Toodles', another Silver Tabby who was Best Short-haired Cat in Show. 'Dunsden Abdul' duly went on to become a Champion in his own right. Other than this lovely photo of 'Miss Hamet' we know little other than she was the product of a mating with an outside queen. To date, we have found no evidence of any progeny being registered from 'Miss Hamet'. Although Miss Leake's advertisements allude to 'The Marquis' being a reliable stud who produced kittens that were winners of 'firsts' in their respective classes, to date we have found no official record of progeny registered from him which could lay claim to these distinctions. Note the byline under the heading, which states: '14 Years of Prize Pedigree', which alludes to Miss Leake's successes on the show bench since 1889, with 'Ch. Topso of Dingley' (1886), through to what was the current day. 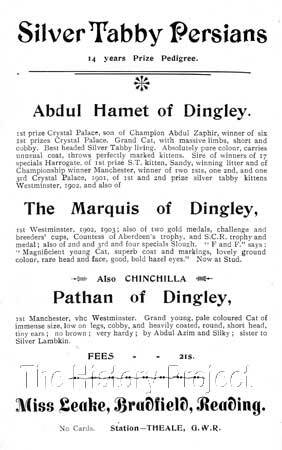 Note also, the pride taken in advertising 'The Marquis of Dingley' as the prize-winning son of 'Abdul Hamet'. At this juncture suggesting that he is clearly earmarked as a possible successor to his famous sire. Mrs Clark's stud adverts taken from the 27th August and 3rd September issues of Our Cats 1904.4 One clearly including 'Marquis of Dingley', the other sadly showing he has now been removed. The above stud advertisements are a melancholy reminder of the uncertainty in breeding livestock, one proudly including the addition of the magnificent Silver Tabby, 'Marquis of Dingley' in the line-up of top stud males on offer at the 'Ashbrittle' cattery. The other, with 'The Marquis' removed after his sudden and tragic demise. 'The Marquis of Dingley' during his short time was as famous, if not more so, than his sire-sibling, 'Ch. Don Pedro of Thorpe'. His successes as a kitten and as a cat added yet more glory to the already burgeoning fame of his sire, 'Abdul Hamet of Dingley', who could already lay claim to be the sire and grandsire of more Silver Tabby winners, than any male that had yet lived. Due in part to his grand looks and stature as an adult he cemented, yet further, the crown upon the 'Dingley' strain as a 'must-have' for anyone wishing to pursue and preserve the beautiful patterns that were the stamp of the cats from these bloodlines. His short life was a reminder that true beauty is most often a transitory and fleeting gift, to be prized, enjoyed and celebrated as fully as possible, while it yet lives amongst us.